A couple of weeks ago I wrote about the S-25 rocket, the largest unguided air-to-surface unguided rocket used by the Syrian Air Force. Following that piece I was sent the remains of another munition, captioned "Missiles fired by Assad's airplanes on Ma'arat al-No'oman (Idleb Province)"
This time we have a type of air-to-surface missile known as a AS-14 (Kedge). What we can see in the above picture is the warhead section, that sits just before the guidance system, which can include a variety of laser based guidance systems. The warhead weighs 320kg, and is intended for large targets, such as large buildings and bridges. More images of the complete missile can be found here, with the final image of the set showing where the warhead is positioned. Well spotted, I was wondering what the thing is! One slight correction, however: Kh-29 never had radar guidance, it is either semi-active laser homing (Kh-29L / Kedge-A) or TV-guidance (Kh-29T / Kedge-B). Most likely this missile was fired by a Su-22M4 or Su-24MK aircraft. Excellent, I was looking for a cross section as it's not obvious where the warhead fits in. I've removed the reference to radar guidance as well. is it unexploded ??!! and why ? It's hard to say, there could be a variety of reasons. 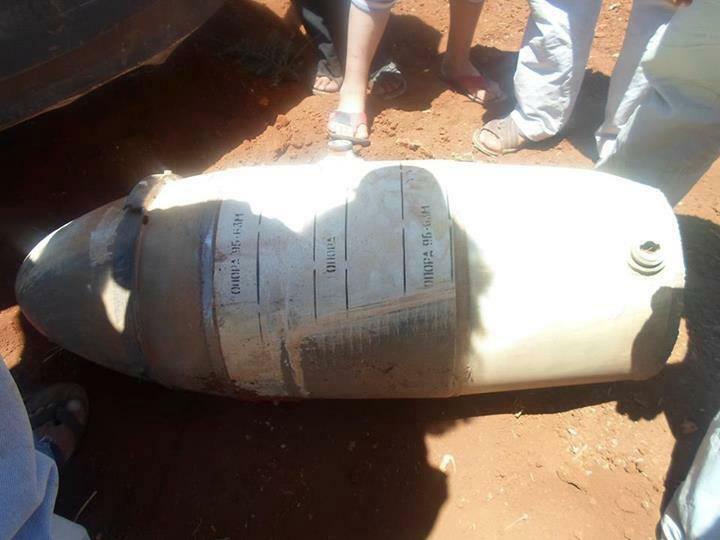 Syria is going to be littered with unexploded bombs, and that'll take some time to clean up after the conflict. In the provided pictures it looks like the warhead is behind the guidance system not before it as written, unless I reading something wrong.